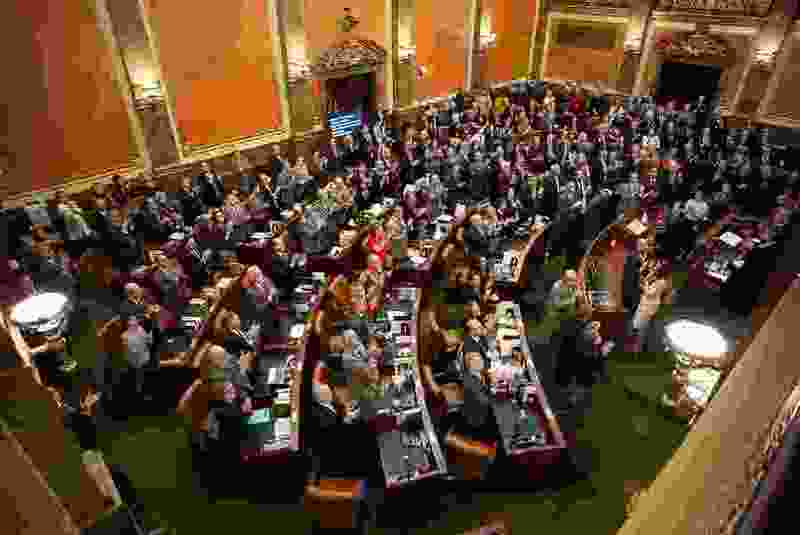 (Trent Nelson | The Salt Lake Tribune) A full House Chamber stands and applauds families who lost loved ones in law enforcement, military and public service as Governor Gary Herbert delivers his State of the State address at the Utah Capitol in Salt Lake City on Wednesday Jan. 30, 2019. Suicide is a major public health issue in Utah, yet we know suicide is preventable. Legislators are working on policies to help communities save lives and prevent tragedy. The most significant policy proposal this year is the evidence-based House Bill 209 Extreme Risk Protective Order, or “red flag,” bill from Rep. Steve Handy, R-Layton. ERPOs are a civil procedure where family members or law enforcement may petition a judge to temporarily remove firearms from someone who poses an imminent, dangerous threat of harming themselves or others. ERPOs are applicable in the most extreme cases, where voluntary action or other interventions have failed. A judge may only order an ERPO based on evidence an individual’s own behavior poses a dangerous threat. Evidence a judge may consider includes recent threats or acts of self-harm or violence toward others, reckless use of a firearm, history of use, attempted use, or threatened use of force against others and evidence of a recent pattern of violent acts or threats. An initial ex parte order may be granted upon determination by a judge, based on sufficient evidence,that temporary suspension of access to firearms is appropriate to diffuse the situation and/or to ensure public safety. Legally speaking, ex parte orders require a showing of great or irreparable injury or immediate and present danger that must be mitigated before the matter can be heard on notice. That is why ex parte orders are also used in the context of domestic violence. An ex parte order lasts only up to 14 days before a full hearing is held and a respondent may appeal for return of the firearms. At the hearing, the evidentiary standard rises and a judge may only extend the protective order if clear and convincing evidence is presented that the person remains a threat. Otherwise, the ex parte order ends immediately. Either way, firearms are returned upon the expiration of an extreme risk protective order. Further protections for respondents are written into ERPO law in the form of strict penalties for false claims — it is a third degree felony to knowingly provide false information when seeking an ERPO. Extreme Risk Protective Orders (ERPOs) are shown to significantly reduce firearm suicides and connect at-risk individuals with behavioral health services when necessary, while respecting due process and Second Amendment rights. Extreme risk protective orders do not infringe on a responsible citizen’s fundamental right to possess a firearm for self-defense, and they are not a “collective punishment” nor a “collective action” toward all gun owners. A resolution offered by Rep. Cory Maloy, R-Lehi, HJR 7, suggests that ERPOs are not needed based on current state laws regarding firearms. However, none of the codes referenced in the resolution provides critical intervention at an earlier point for people who do not already fall into one of the federally prohibited persons categories for firearm restrictions. There remain crucial gaps in the law that extreme risk protective orders would fill. HJR 7 emphasizes Utah’s firearm “safe harbor” law, where someone in crisis can voluntarily turn in guns to law enforcement. ERPOs are applicable in cases where voluntary efforts fail or would not be safe for the families involved. Safe harbor also fails to prohibit a person still in crisis from purchasing new firearms after voluntary surrender. A proposal to expand safe harbor to allow cohabitants to remove someone else’s firearms lacks due process protections offered by an ERPO. Fourteen states have passed ERPO laws as an important tool for suicide prevention, balancing public safety with respect for Second Amendment rights. We know these laws are working, and lives are being saved. Families and community members should call on the Utah Legislature to pass this important bill to help prevent suicides in Utah.